We’ve had a little secret lurking in our garage for the past dozen or so years. Make that a very little secret as in a car that weighs less than half as much as a contemporary Fiat 500. 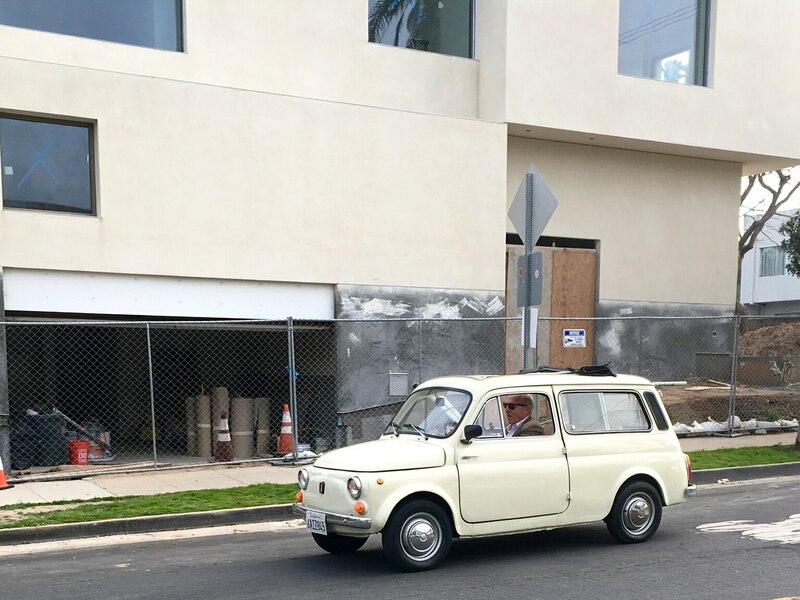 In fact, the little secret is a Fiat—a 1967 Fiat 500 Giardinera made almost 53 years ago by FIAT S.p.A, FCA’s predecessor company. 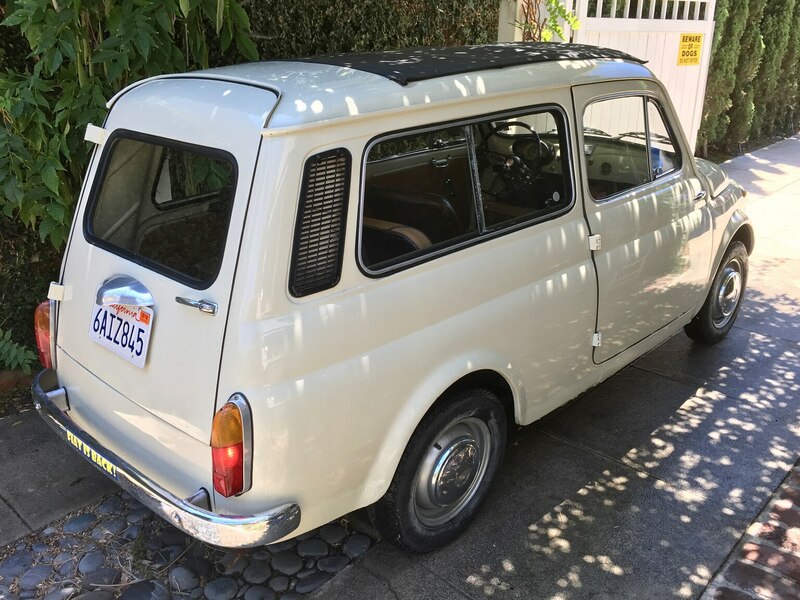 Ours was actually produced by Autobianchi, a Fiat vassal company, if you want to be specific. The Giardinera (“Gardener”) is one of the smallest station wagons ever built. Its two-cylinder, air-cooled 499-cc motor is mounted on its side like a fish that flattens itself while swimming. In the vernacular, this installation is called a sogliola, as in the style of a filet of sole. 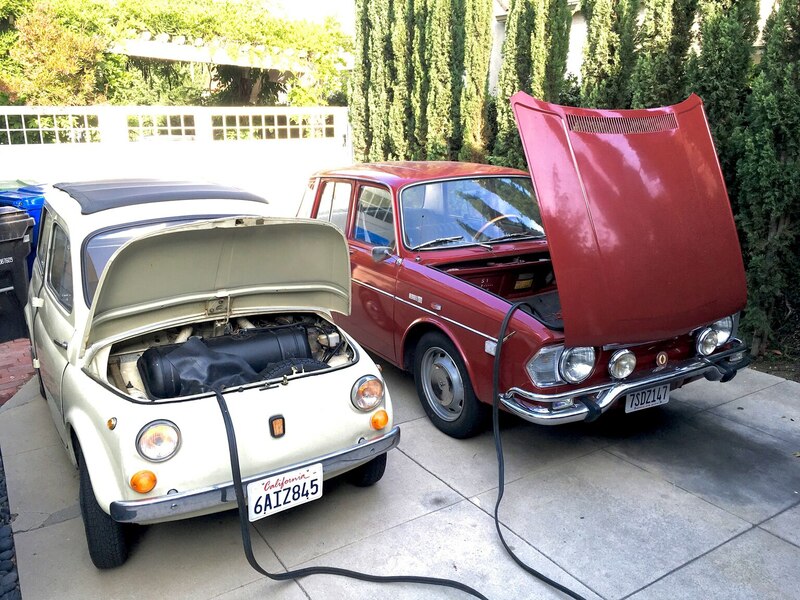 The configuration made it possible to have a flat load surface; something VW copied a few years later with its Squareback and Fastback, albeit with an additional two cylinders. There’s a tiny and not terribly useful trunk up front where the spare and the 5.6-gallon gas tank reside, but folding down the rear seat enables you to carry a considerable amount of cargo. It’s really a sport-utility vehicle in the strictest sense of the term and there is, in fact, quite a bit of a “sport” aspect to it. We religiously employ it to bring home tomato seedlings and soil amendment when we visit the nursery each spring. Seems only appropriate and you can think of the car as a means to an end; the end being, of course, marinara sauce made from home grown tomatoes. With only 17.5 horsepower on tap, it’s a pretty slow fish but it’s cute to look at and fun to drive—once the terror of sharing public roads with behemoth SUVs subsides. 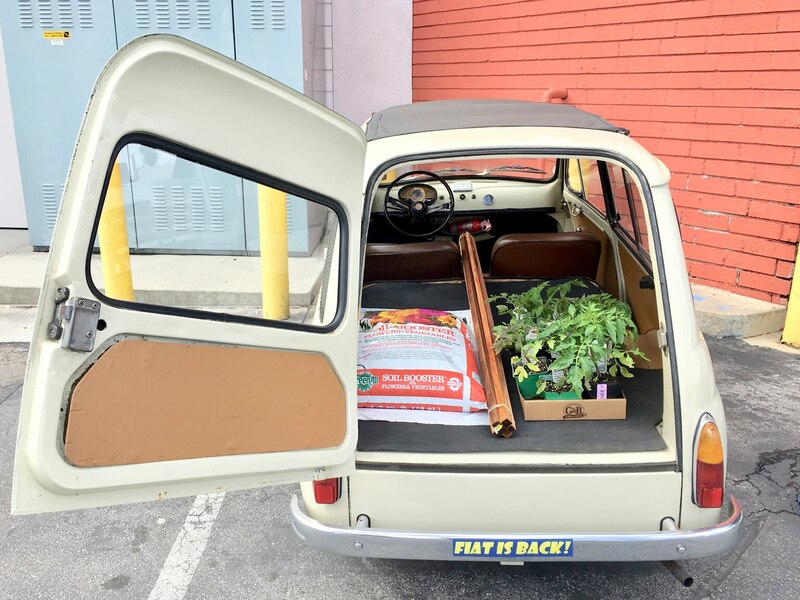 This remarkable little meatball—food analogies always spring to mind when discussing this car—put Italy on wheels back in the ‘60s, a national phenomenon akin to the Mini in the U.K., the “Deux Chevaux” in France and is, obviously, VW Beetle-inspired. It’s a good-natured little car and rowing through the gears is, like minestrone, good for the soul. Because it’s so very small and rolling on 12” wheels, 35 mph in this car tends to feel like 75 mph in a normal size vehicle. Keep in mind that as far as old Cinquecentos go, the Giardinera is the “grande” version, an oxymoron on par with “jumbo shrimp.” The run-of-the mill Cinquecento two-door sedan was introduced in 1957 with production continuing for 20 years; the Giardinera came three years later, an 8.0-inch stretch resulting in some usable cargo space, and it, too, was produced into the ‘70s. Ultimately, Fiat and its licensees built 3.5 million Cinquecentos of which a mere 330,000 were the Giardinera wagon models. While the sedan did away with its rear-hinged doors in 1965, the Giardinera soldered on with suicide doors, giving it added distinction/quirkiness. Up top is a full-length fabric sunroof that underscores the reality of just how very little real structure there is. Acceleration can best be described as leisurely. There’s no point in mentioning 0 to 60 mph figures since a top speed of 59 mph is claimed, though achieving anything above 50 mph is a considerable accomplishment. What it does well is put on a happy face, the point of this car being barebones utility and a step up from a motor scooter with equivalent fuel economy of roughly 50 mpg. 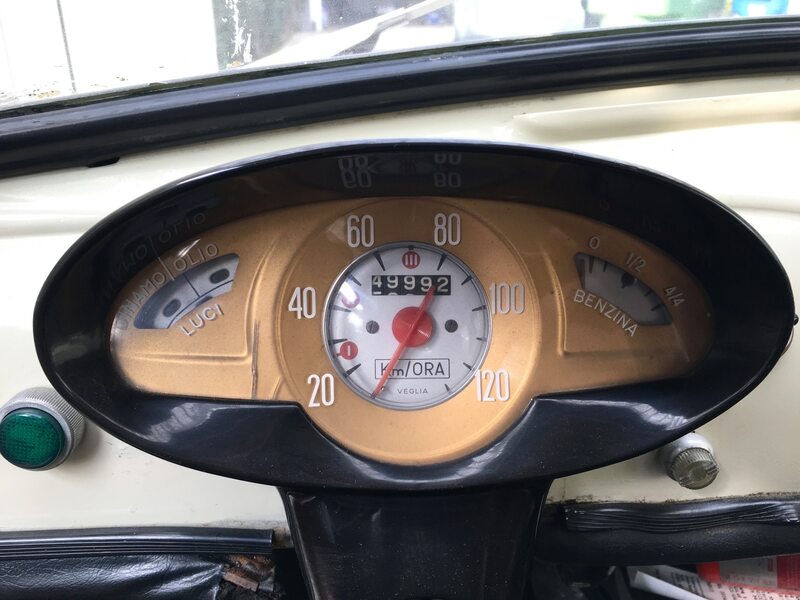 Keeping such an Italian classic running hasn’t been much of a problem. Mechanically it’s very straightforward and there’s Alex Gerstl for spares. His enterprise, paradoxically based in Bavaria, is now in its 21st year and stocks just about everything one might need to keep a Cinquecento moving. We ordered a brake master cylinder a while back and the elapsed time between order and delivery on the other side of the world was about four working days. 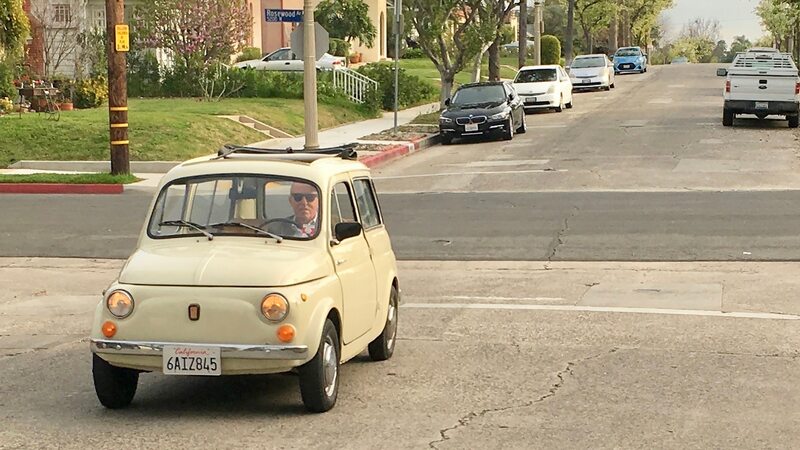 He’s a big Cinquecento booster, offering information about club meets in various countries and sponsoring a photo contest, always nurturing the cult of the cute. 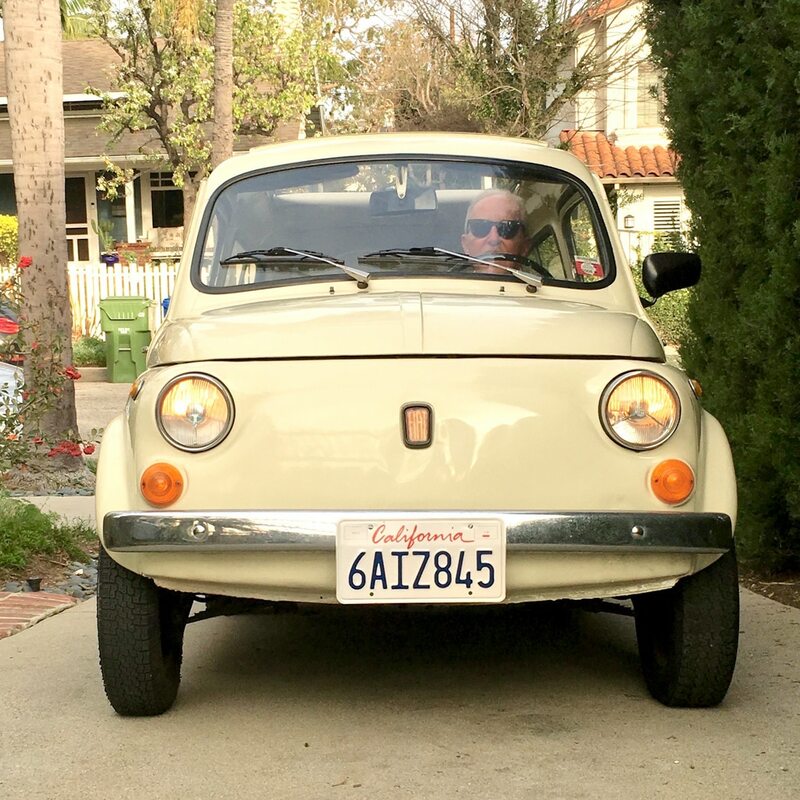 Children are especially fond of the Cinquecento; to young imaginations, it’s as if a toy has come to life and, of course Cars star Luigi, voiced by Tony Shalhoub, is Cinquecento-inspired. 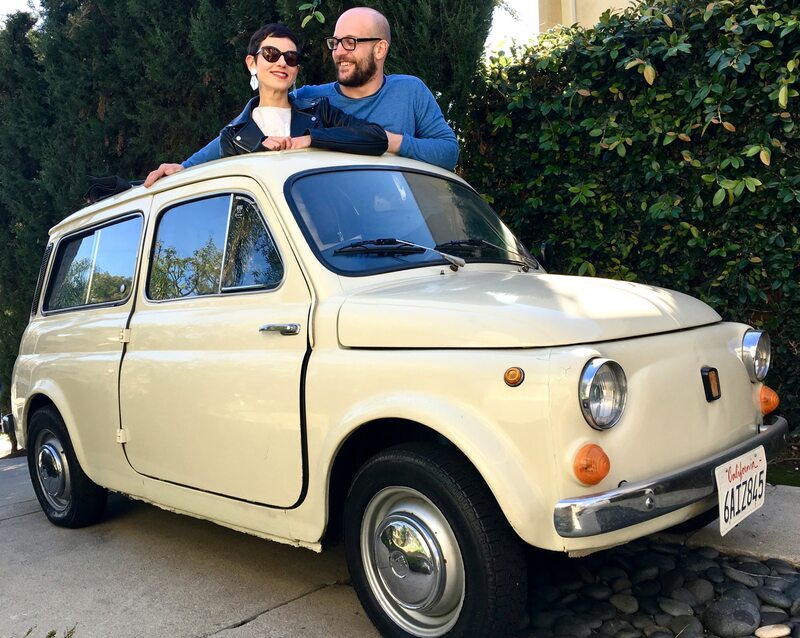 For Italians, the car is a cultural touchstone that evokes memories of a simpler time when Italian society, in the wake of fascism, was being transformed by the Western European economic miracle. 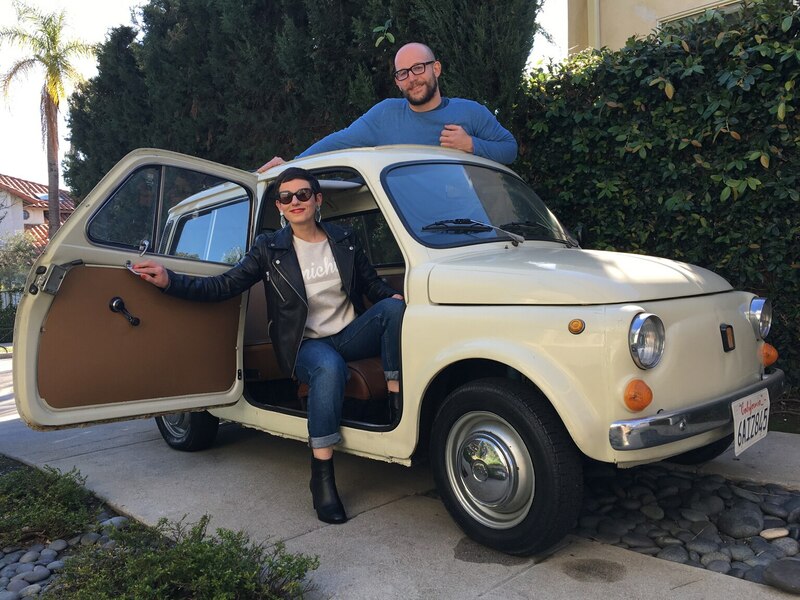 We recently hosted a delightful couple from the Campania region, Maria Cinque (but she calls herself “Mary”) is a gifted artist and Pasquale (“Paco”) Ruocco is an accomplished chef. They currently live in London but soon may have to deal with the consequences of Brexit so memories of their homeland are especially resonant. Mary’s mom was a French teacher so, of course, she drove a Citroën but Paco’s family favored the Cinquecento’s successor, the Fiat Panda and Fiat 126 in the 1970s. 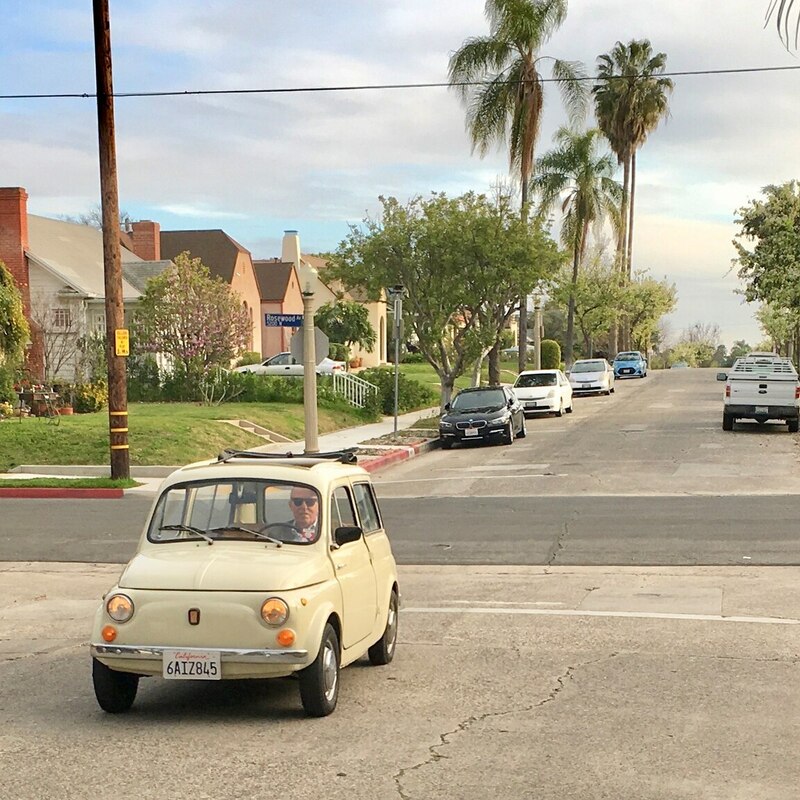 Driving them around Los Angeles in the Giardinera brings the simplicity of post-war Italy into quasi focus, as they were too young to experience it for themselves. This is the way it was during the youth of their parents: a simple car for lives lived more simply. That, of course, is a thing of beauty. Che bella la vita! To be honest, we don’t drive our little Giardinera all that often but when we do, it’s always memorable. Isn’t that the thing that distinguishes a great car from mere transportation?